Any social media marketer or Facebook business page owner who reviews engagement numbers on their Facebook page understands exactly why I’ve added a “still” to the title of this post. Over the last year or so, engagement numbers on Facebook business pages have dropped dramatically and it’s not just because of Facebook’s slowing user growth, it’s because of Facebook’s News Feed algorithm. You’ll have to check out that link for a full description of how their algorithm works, but, in short, Facebook is deciding which posts appear most frequently in your News Feed based on your settings and how you’ve previously engaged with content. This especially rings true if you have your News Feed settings defaulted to “Top News” rather than “Most Recent”. So, what does this all mean? It means diminishing reach and engagement for all Facebook business pages. Over the past year, I’ve managed up to 10 business pages and the numbers I’ve seen are staggering. Pages with 300-500 Fans only reaching 40-75 people and posts which reach over 100 people only receiving 1 or 2 engagements (an engagement is considered a “Like”, Share or Comment on a particular post). There are a plethora of reasons why this is happening, but that’s another blog post for another time. This blog post is all about the brands that are still getting great Fan engagement, despite the Facebook algorithm, and how you can mimic what they’re doing to boost your engagement levels. 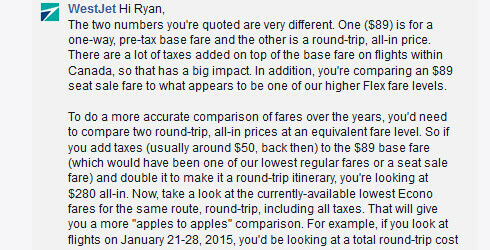 Most people in Canada know WestJet as the value Canadian airline that competes with the big boys at Air Canada. Most people abroad know WestJet as the “airline who did the Christmas miracle”. They’ve actually just released another holiday marketing campaign that they’re hoping is just as big of a success. What they do really well on Faceboook? Outside of those massive video marketing campaigns, they do a great job year-round with their message of connecting families and bringing people together. They update on a daily basis with special affordable flight fares, travel advisories and much more. What’s most impressive? They answer questions directly and thoroughly. Samsung Mobile is the smartphone and tablet division of Samsung. What’s most prominent on their Facebook page? Product, product, product! They run fantastic social media campaigns like their “#cutestanimal” campaign which features images of their smartphones taking pictures of cute animals. Who wouldn’t want to share and engage in something like that? What they do really well on Facebook? Providing pictures and videos shot using their product and putting them on display is a great way to not only show off product but promote your brand as well. They also engage Fans with Facebook specific videos of how to make the most out of their device. 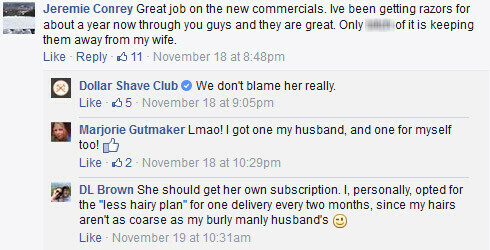 Dollar Shave Club was put on the map by their unique and aggressive social media campaign, headlined by this video of their owner running through all the reasons their razors are “the @#$%^ best”. Almost all of their marketing is done online and they’ve grown so quickly that the idea of mailing razors is being copied by large competitors. In a word – personality. Their Facebook business page seems more like a funny “friend” you would hang out with than a business page. They reply to nearly every comment and post on their page within 24-48 hours with a funny, witty and information-based response. I’m not much of a coffee or latte drinker myself, but as a marketer, I can’t help but love basically everything that Starbucks does. You don’t get to 35,000,000+ Fans on Facebook by not being engaging. They regularly run contests, feature pictures and videos of their Fans and respond to all comments in a timely fashion. Can I get away with saying “everything” and leaving it like that? No? Ok, fine. Overall, outside of Facebook, Starbucks has built a brand that Fans truly love. How many of us know someone who can’t live without Starbucks? 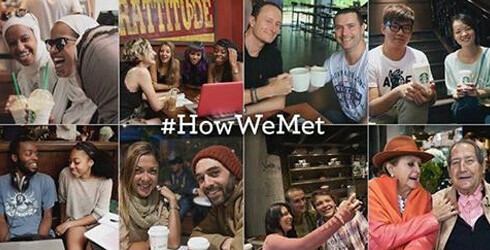 Everything from baristas memorizing customers’ names to their “#HowWeMet” campaign on Facebook is all about the customer. And at the end of the day, that’s who truly matters most. What’s the Experience Gap and What Does It Have to Do with Customer Loyalty?